Thank you so much for backing Witchful Thinking. We broke $1,000 after only a day and a half, you guys rock! I wanted to celebrate October (or the month of Halloween as I call it) by sharing Witchful Thinking with the world. I also want to celebrate the month of Halloween with offering suggestions to all of you on how you too can get into the Halloween spirit. I personally like to celebrate the month of Halloween by watching scary movies (mostly cheesy '80s Slasher movies) and playing horror-themed tabletop games. Tonight, my wife wants to watch the Ghostbusters remake. Unfortunately, we won't be getting around to playing any tabletop games tonight. You might not have time to do both due to my late update. Bonus points if you get around to both though. Favourite scary movie or the next scary movie you plan to watch. Favourite horror-themed tabletop game or the next horror-themed tabletop game you plan to play. Thanks for backing, you guys are amazing! Included in each copy of Witchful Thinking are 16 Character cards. Character cards are optional, and offer players unique gameplay abilities. 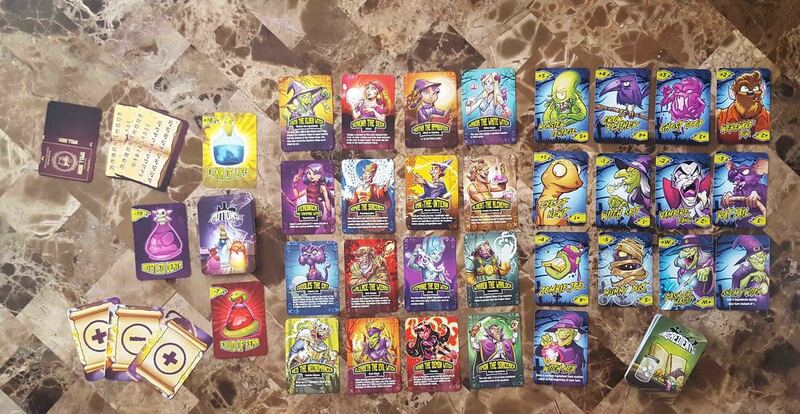 Each Character card is double-sided and has a different Character Ability on each side. In total, there will be 32 Character Abilities for players to choose from. Character cards can be randomly selected before the game starts, or players and simply choose which character they want to be. In either case, players can only choose 1 Character Ability, or card side, per game. With 32 Character Abilities to choose from, Witchful Thinking offers lots of replayability. Once Witchful Thinking is fully funded, we will reveal a new Character card for every $500 raised. The Kickstarter video already revealed 4 of the witches, so we will look at a new witch each week. Edith is the oldest and the wisest witch in the coven. Her first ability, Potion Master, demonstrates how great she is at brewing potions. This ability automatically gives the player +1 to the Cauldron Value. How this ability works is if a potion is worth +14, for example, Edith only needs to put +13 worth of ingredients into the cauldron to make the potion, whereas everyone else needs to put in +14 worth of ingredients into the cauldron. Edith's other Character Ability, Stretch the Ingredients, further shows how gifted she is at brewing potions. This ability allows the player to divide the potion in half. 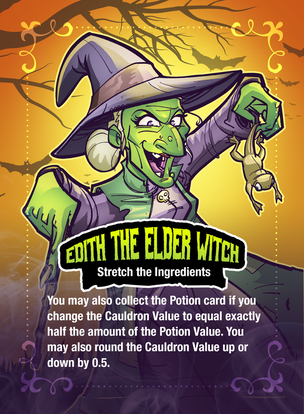 For example, if a potion is worth +4, Edith can make the potion if she puts in +2 worth of ingredients into the cauldron or +4 worth of ingredients into the cauldron. If a potion is an odd number, such as -7, Edith can make the potion if she puts in -7 worth of ingredients into the cauldron just like everyone else. Or she can put -3 worth of ingredients into the cauldron, and then round the Cauldron Value up by .5, which makes -3.5, which is half of -7. Tell us in the comments how you plan to celebrate the month of Halloween tonight, and what you think of Edith the Elder Witch. Also, are you dressing up for Halloween? Usually my go-to is to dress up as a Ghostbuster. One year, I left things to the last minute so I searched through my clothes. I found a Ravenclaw scarf, shorts, sunglasses and a Hawaiian shirt. What did I dress up as? A Hogwarts student on summer vacation. Another year I wore my regular clothes, but pulled one of my hands in the sleeve of my hoodie. I told people that I was The Thing still trying to imitate a human. ​Tell us what your Halloween costume ideas are in the comments. As a reminder, the Early Bird Reward Option for Witchful Thinking ends tonight at 10:00 pm MDT. Spread the word to friends, family, and complete strangers... but maybe stay away from the sketchy ones. John Carpenter's The Thing is an amazing movie, one of my favourites for sure. The story is solid, and the special effects are amazing, even when you compare them to modern movies today. My wife gave me The Thing: Infection at Outpost 31 as a gift for Christmas last year. We played it with a few friends, and I really enjoyed the game. When we played, one of my friends was convinced that I was The Thing and convinced the group to tie me up as a precaution during several rounds. The only problem was that him and I were both human and everyone else was The Thing. It is a lot of fun. Next week, we will be introducing another witch from the Kickstarter video for Witchful Thinking. We have already seen Edith the Elder Witch, but we still need to introduce Serena the Seer, Agatha the Apprentice, and Wanda the White Witch. Tell us in the comments which witch you are most excited to see next week, and as always, tell us how you plan to celebrate the month of Halloween. New backers are joining everyday to help make Witchful Thinking a reality. Thank you for believing in this project! I really enjoy Sleepy Hollow, it is a fun scary movie with a bit of mystery. A Touch of Evil: The Supernatural Game is essentially based off of the movie. So, if you don't have enough time to do both tonight, you'll get a similar experience from either one. Also, does anyone bake homemade treats for Halloween? Or is there anything new you would like to make this year? Tell us in the comments and include the recipe. I personally have not baked/made any homemade treats for Halloween. However, my wife usually makes Worms and Dirt (Chocolate Pudding, Oreo crumbs, and Gummy Worms), and Halloween-Themed Sugar Cookies. Witchful Thinking is now 73% funded! Thank you so much for believing in this project! As a reminder, when Witchful Thinking reaches its funding goal, we will reveal a new Character card for every $500 raised. I am a huge Ghostbuster fan, I even have my own uniform. Some of my friends probably wouldn't consider me to be a true Ghostbuster fan though, most of them have their own proton packs. Ghostbusters II is a really fun sequel. I remember when I was five, I had a dream of being in the museum with Vigo (The bad guy in the painting). Tom and Jerry, the animated cat and mouse, were also there. In the dream, Tom was chasing Jerry, and then Vigo came out of the painting and chased both of them. Tom and Jerry then worked together to defeat Vigo by taking the two AA Duracell batteries out of the painting. When the batteries were out, Vigo disappeared and Tom and Jerry celebrated. I have only played Ghostbusters: The Board Game II once, but I really enjoyed it. To be fair though, I love the theme so I would like the game no matter what. Planes,Trains and Automobiles is a perfect Thanksgiving movie; it's a comedy, a drama, and it keeps with the Thanksgiving theme. Steve Martin and John Candy have great chemistry on screen. The Game of Things is a fun social game that a large number of people can play. I recommend this game for Thanksgiving because anyone can play it, even Grandpa Joe and Aunt Linda who don't know how to play the simplest of tabletop games. What do you think of my recommendations today? Also, what do you think of my Ghostbusters II dream? Let us know in the comments. John Carpenter is probably my all-time-favourite filmmaker. He writes, directs, and composes music for his films. He even acts in The Fog. If I were to make a list of my favourite movies, John Carpenter directed most of them. The Fog is an ensemble movie with a great cast. Most of the actors from Halloween are in The Fog, even Jamie Lee Curtis. The Fog is about a coastal town that is cursed by ghosts. One of the backers for Witchful Thinking recommended One Night Werewolf as a tabletop game. I admit that I have not played this game yet, but I have heard good things. Every year, I always feel the need to watch the Rocky movies around Thanksgiving. Rocky is a great film, period. Kill Doctor Lucky is essentially the prequel to Clue and can be played with 3 - 8 players. So if you have a lot of people over for Thanksgiving, everyone should be able to play. Even your guests who are intimidated by tabletop games will be intrigued by Kill Doctor Lucky because it is Clue with a twist. Also, the game keeps with the Thanksgiving theme because the players are thankful that Doctor Lucky is old, frail, and has lots of money. What do you think of my recommendations? Tell us in the comments. Today we will be introducing a new Character card. She goes by many names, the Oracle, the Fortune-Teller, the Psychic, but her real name is Serena the Seer. Serena uses her crystal ball to look into the future. 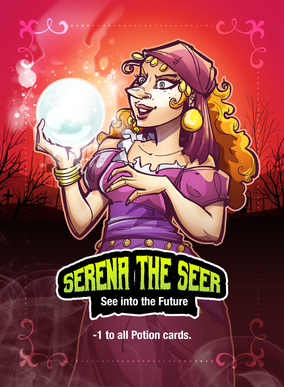 Serena's first Character Ability, See into the Future, represents Serena looking into her crystal ball to see what potion the witches will make next. This ability reduces the value of each Potion card by 1. So, if the witches have to make a potion that has a value of +10, Serena only has to use +9 worth of Ingredient cards to make the potion! Serena's second Character Ability, Gifted, represents Serena's psychic powers and is very powerful! This Character Ability essentially turns Serena's Character card into a Wild card. Before the round begins, the player with Serena's Character card can assign a value from -5 to +5 to the card. So, for example, if the player assigned -3 to the card and the witches have to make a potion that has a value of -11, Serena only has to use -8 worth of Ingredient cards to make the potion. 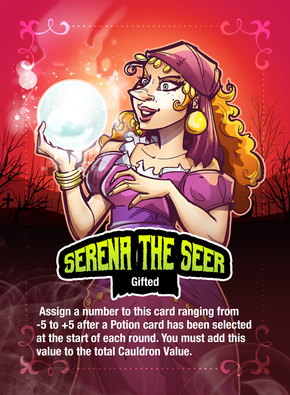 What do you think of Serena the Seer? Also, how will you be decorating your Jack-O-Lantern this Halloween? Tell us in the comments. Witchful Thinking is now over 75% funded and we still have 3 weeks left! Thanks again for believing in this project. Corpse Bride is a stop-motion animated film starring Johnny Depp and directed by Tim Burton & Mike Johnson. It is about a young man who accidentally marries the wrong bride who is a corpse... except she can walk and talk. It is a funny movie that definitely deserves a watch. Bring Out Yer Dead is a game of finding the best graves for your dead family members. The better plots in the cemetery are worth more victory points and whoever has the most victory points when the game is over wins. As Dr. Abraham Van Helsing said in the film, Dracula Dead and Loving It, "Everything in life is location, location, location". What do you think of my wife's recommendations? I think they're great and no my wife is not looking over my shoulder as I write this. Also, what were your favourite Halloween candies when you went Trick-Or-Treating as a kid? When I went Trick-Or-Treating, I loved getting Caramilk, Crispy Crunch, and Reese's Peanut Butter Cups. First, I am excited to announce that instead of introducing one new Character card each week, we will be introducing one new Character card everyday starting tomorrow! For those of you who are new backers, included in each copy of Witchful Thinking are 16 Character cards. Character cards are optional, and offer players unique gameplay abilities. Each Character card is double-sided and has a different Character Ability on each side. In total, there will be 32 Character Abilities for players to choose from. Character cards can be randomly selected before the game starts, or players can simply choose which character they want to be. In either case, players can only choose 1 Character Ability, or card side, per game. With 32 Character Abilities to choose from, Witchful Thinking offers lots of replayability! That's right! Variable Outcomes is excited to announce that all Kickstarter backers who are receiving Witchful Thinking as a reward will also receive a special Kickstarter Exclusive Character card that will not be available for retail! We will unveil this new Character card soon enough, so check Witchful Thinking's Kickstarter page regularly! Finally, our Kickstarter page has been updated. Please check it out, and tell us what you think. ParaNorman is a clever stop-motion animated film about a boy who can see ghosts and lives in a cursed town. Halfway through the movie, zombies are hunted down by humans, which brings us to my next recommendation. Humans!!! is a tile board game where you are a helpless zombie who is being hunted by merciless humans. It is a lot of fun. The game is even more epic when combined with Zombies!!! What do you think of my recommendations? Or the big news about the Kickstarter Exclusive Character card? Tell us in the comments. 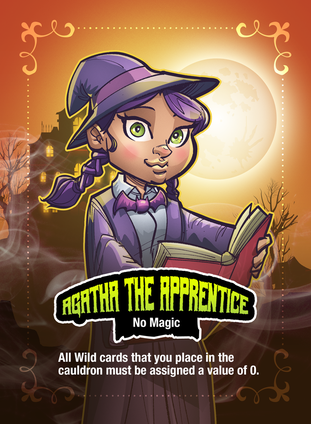 Today, we will be introducing the youngest witch in the coven, Agatha the Apprentice! Agatha's first Character Ability, Witch in Training, represents her skills at brewing potions. 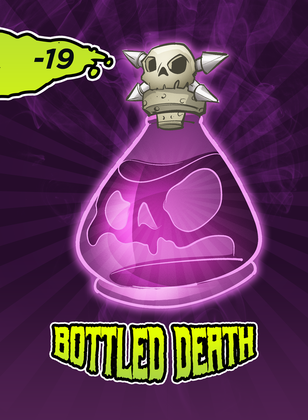 This Character Ability increases the value of each potion by 1, so if a Potion card is worth +6, Agatha will need to use +7 worth of Ingredient cards to make the potion. Agatha is only a beginner and doesn't have the same level of expertise that the other witches have at brewing potions. Don't worry though, Agatha, you'll be a great witch someday. Your mentor, Edith, and the other witches in the coven will make sure of that! Wild cards are assigned a number ranging from -5 to +5 when they are placed in the cauldron. The variation in value represents how powerful, or weak, the magic is while inside the cauldron. Since Agatha is new at witchcraft, her magic does not affect potions yet. Agatha's Character Ability means that she can add magic into the cauldron, but it must be assigned a value of 0. In the Mouth of Madness is a film directed by John Carpenter and starring Sam Niell. In the Mouth of Madness is inspired by the Cthulhu Mythos. A young Hayden Christensen, or Anakin Skywalker as you may know him, has a small part in the movie, as well as Wilhelm von Homburg, or Vigo the Carpathian as you may know him (the bad guy from Ghostbusters II). Arkham Horror might be our family's favourite tabletop game ever. It has depth, story, strategy, chance, lots of replayability, and it's based on the Cthulhu Mythos. I strongly encourage you all to give Arkham Horror a playthrough at some point during the month of Halloween. It's also fun to play during New Year's Eve because it has an end of the world vibe. Also, is anyone decorating the inside or outside of their house for Halloween? My wife and I do every year. We put an animatronic ghost outside with Jack-O-Lanterns, spider webs, and tombstones. Inside, we have skulls and other witchcraft items such as spell books and potion bottles. We even have a Halloween-Themed wreath on our front door. One day, we hope to have the scariest house around. 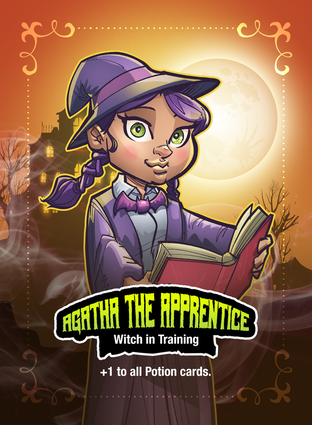 What do you think of Agatha the Apprentice? Also, how will you be decorating your home for Halloween? Tell us in the comments. Today we will be introducing the kindest witch in the coven, Wanda the White Witch. For those of you who don't know, white witches worship Mother Nature and only use their powers for good. Basically, the term 'white witch' describes someone who practices witchcraft, but is not evil. 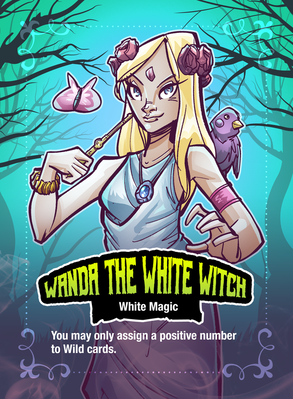 Wanda's first Character Ability, White Magic, represents Wanda's preference of only willing to use good magic to make potions. This Character Ability means that Wanda can only assign a positive number to Wild Ingredient cards when she puts them in the cauldron. 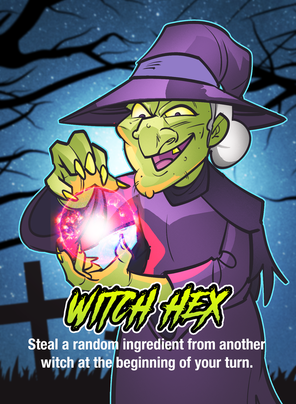 Witch Hex cards allow witches to steal Ingredient cards from other witches. 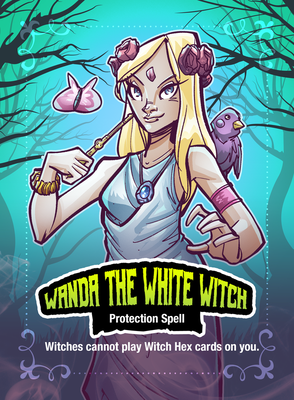 Other witches cannot play Witch Hex cards on Wanda because of her Protection Spell Character Ability. Van Helsing is a great Halloween movie because it has most of the classic monsters, such as Dracula, Dracula's Brides, The Wolfman, Frankenstein's Monster, Dr. Jekyll and Mr. Hyde. Munchkin Bites! is a silly Halloween-Themed card game that is great for the whole family. What do you think of Wanda the White Witch? Also, what do you think of my recommendations? Tell us in the comments. Today is October 13th, and although it is not Friday the 13th, you may want to play it safe out there today. Many people consider the number 13 to be very unlucky. Other well-known superstitions are breaking a mirror, walking under a ladder, and a black cat crossing one's path. Which brings us to the my next point. Today we will be introducing the cutest member of the coven, Cuddles the Cat! ​He may be cute, but he's been with the coven for a long time and now he's old and cranky. 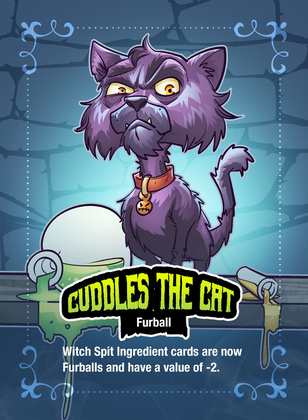 Witch Spit Ingredient cards have a value of -1, but since Cuddles is a cat, he uses Furballs instead, which has a value of -2. Even though it is not Friday, it is the 13th, so I think recommending a Friday the 13th movie is appropriate. Why not recommend the first movie in the series then? Because Friday the 13th Part IV: The Final Chapter might be my favourite in the series. However, if you have never seen a Friday the 13th movie before, you should probably start with the first one. SPOILER: Friday the 13th Part IV: The Final Chapter is not the final chapter. Zombicide is a game about some unlucky survivors who are being hunted by zombies. It is a lot of fun... for tabletop gamers, not the survivors. What do you think of Cuddles the Cat? Also, what do you think of my recommendations? Tell us in the comments. Today we will be introducing an extremely powerful and mysterious magical being. Even the other witches in the coven don't know much about him, but they all sense a dark presence inside him which gives him supernatural abilities. Serena the Seer believes something sinister from the unknown, perhaps from another dimension, possesses him. His name is Warren the Warlock! Warren's first Character Ability, Magic Spell, represents Warren's mastery at bending magic, even magic cast by others, to his will. This Character Ability changes the value of all Wild cards in the cauldron by -1. For example, if Edith the Elder Witch placed a Wild Ingredient card in the cauldron with a value of -3, the value would automatically change to -4 only during Warren's turn. Warren's second Character Ability, Incantation, represents Warren speaking words of magic to influence the potion in a certain way. This Character Ability compares the Cauldron Value to the Potion Value. 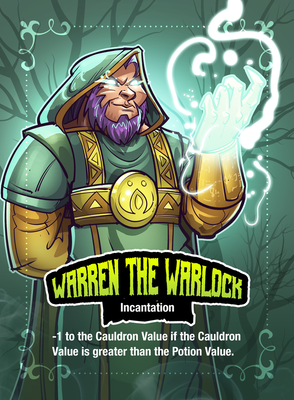 For example, if the Cauldron Value, meaning the value of all 4 Ingredient cards added together, is greater than the Potion Value, Warren will automatically reduce the Cauldron Value by 1. So, if the Cauldron Value is +13 and the Potion Value is +12, Warren collects the Potion card as a reward without doing anything during his turn. You might be wondering why I recommended a science fiction movie that is clearly not Halloween-Themed at all. Well, the reason is because the enemy in the movie are the Borg. Think about it, the Borg appear to walk around as mindless beings and they look very sickly. Does that description remind you of anything? One character in the movie even refers to the Borg as Bionic Zombies. That's scary right? Zombies with technological upgrades from space! Pandemic is a game about a very contagious disease that threatens all of humanity. Pandemic is a fun game with a super-scary theme, perhaps because the threat of a lethal disease is more likely to happen than Space Zombies attacking humans. What do you think of Warren the Warlock? Also, what do you think of my recommendations? Tell us in the comments. Witchful Thinking is getting close to achieving its funding goal. Thank you all for believing in this project! 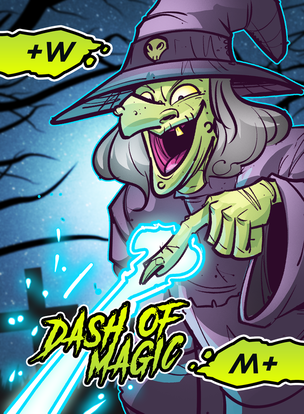 Today we will be introducing a witch who is over 200 years old, but doesn't look it. Not because she is using anti-aging potions, but because she is immortal! Her name is Veronica the Vampire Witch. Veronica's first Character Ability, Vampire, represents her potion brewing preferences. 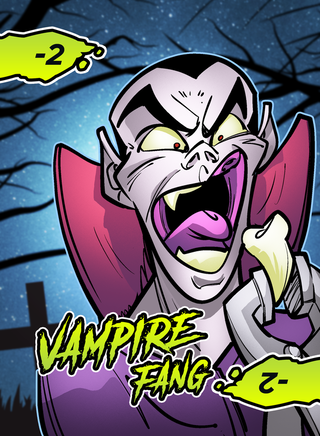 Because Veronica is a vampire, she refuses to use Vampire Fang ingredients to brew potions because vampires, like herself, would prefer to keep their teeth. 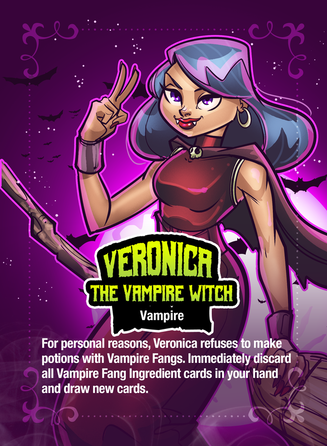 This Character Ability means that Veronica must discard all Vampire Fang Ingredient cards in her hand if she draws them, but she is allowed to re-draw cards until she has 5 Ingredient cards in her hand. Having this Character Ability can be a fun challenge because Veronica cannot use Ingredient cards that are worth -2 to make potions, unless they were put in the cauldron by other witches. Veronica's second Character Ability, Powerful Hex, represents her witchcraft skills that she was able to perfect during her unnaturally long life. 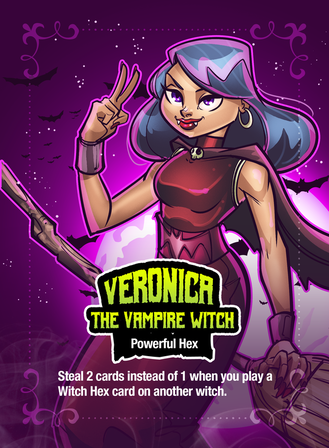 This Character Ability allows Veronica to steal 2 random Ingredient cards instead of 1 when she plays Witch Hex on other witches! Tucker & Dale vs. Evil is a clever Halloween-Themed film with lots of comedy. I don't want to give anything away if you haven't seen it yet, but it is a must see! Slaughterville is a game about a town that is infested with evil. This game has lots of replayability because the players can choose which villain will be the focus of the game. What do you think of Veronica the Vampire Witch? Also, what do you think of my recommendations? Tell us in the comments. We are on the home stretch now! Only halfway through the campaign, and we only need less than $1000 to make Witchful Thinking a reality. I know I say it a lot, but thank you for believing in this project! As you can see, we now have a prototype of Witchful Thinking! Expect to see a How-to-Play Tutorial video soon. ​Today we will be introducing a very quirky man who likes to bring people back from the dead in his spare time. The other witches in the coven think he's a bit weird, but he is great at making potions, so they tolerate him. They also don't mind that he always has a good supply of zombie toes with him. His name is Ned the Necromancer! Ned's first Character Ability, Zombie Helpers, represents his undead assistants aiding Ned in brewing potions. 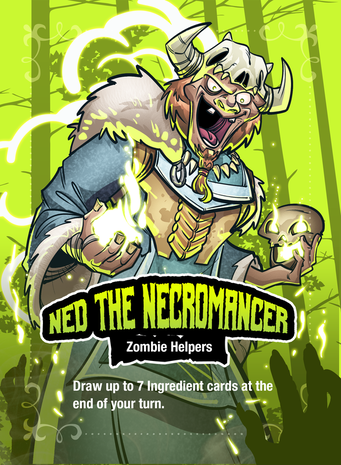 This Character Ability allows Ned to draw up to 7 Ingredient cards at the end of his turn instead of 5. Ned's second Character Ability, Rotten Ingredients, represents Ned's skill at improving the quality of rotted materials. This Character Ability allows Ned to add -1 to an odd-number Ingredient card in the cauldron. This means that if an Ingredient card with a value of -3 was in the cauldron, Ned could change the value of that ingredient to -4 if that was beneficial to him. Alien may be another science fiction film, but it is a horror film as well. A Deadly alien from the unknown viciously killing a group of people who have no where to run? That sounds like a horror film to me! Legendary Encounters: An Alien Deck Building Game is a card game about the movie itself, and is a great game to play with friends or by yourself. What do you think of Ned the Necromancer? Also, what do you think of my recommendations? Tell us in the comments. Today we will finally be introducing the character that you have all been waiting for. That's right, we will be introducing the character from the mysterious Kickstarter Exclusive! As a reminder, this Kickstarter Exclusive Character card will be rewarded to each backer who chose to receive a copy of Witchful Thinking as a reward. Also, this Character card will not be sold in stores. For a few months now, the witches have noticed things, such as potions and ingredients, completely disappearing from the witch house. At first, they just dismissed it as simply forgetting where they had put things. The other witches even accused Edith the Elder Witch of forgetting to put things back in their proper place because of how old she is. Then suddenly shelves were falling apart, potion bottles were breaking, and ingredients were spoiling at an alarming rate. No one could explain what was happening. A few of the witches even thought that some member of the coven must be sabotaging their potion brewing business on purpose! Most of the witches were positive that Ned the Necromancer was behind it all. And then finally one night, Warren the Warlock saw what appeared to be a potion floating near the floor. 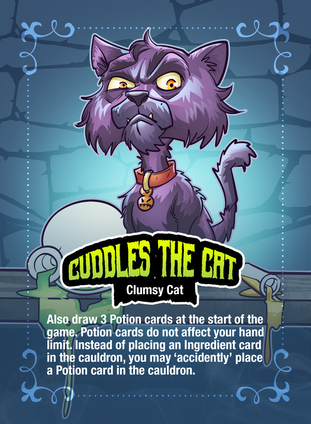 Cuddles the Cat noticed this as well and chased the potion around the house. The potion picked up speed, flew towards a crack in the walls, and then vanished. Luckily Veronica the Vampire Witch, with her keen vampire senses, saw that the potion wasn't floating at all. The potion was in fact being carried by what she described as, "a type of vermin that are a plague to witch houses everywhere!" Although the witches do not know its name, the entire coven is on the hunt for the elusive Grikk the Gremlin! Grikk's first Character Ability, Mischievous, represents every gremlin's instinct of ruining peoples lives and sabotaging their dreams. This Character Ability allows Grikk to force a witch to swap 1 Potion card of his choice with him or another witch, when he plays a Sneaky Witch card. In Witchful Thinking, the winner of the game is the player who has collected the most Potion cards. If there is a tie, all tied players must add their own Potion cards together, and whoever has the greatest value wins. This means that players want Potion cards with positive numbers instead of negative numbers to ensure their own victory. So for example, if a witch has the Elixir of Life which has a value of +18, Grikk can use his Character Ability to take that valuable card away and give it to another witch instead, or he can take it for himself. Grikk's second Character Ability, Trickster, represents every gremlin's desire to play tricks on others. This Character Ability allows Grikk to force a witch to swap their entire hand of Ingredient cards with another witch or himself, when he plays a Sneaky Witch card. Forcing other players to swap their cards with each other can be a useful tactic because you can interrupt what the players were planning to do next. Alternatively, Grikk can use this Character Ability to get new cards if his own cards are no good. Of course I was going to choose Gremlins. It may be a Christmas movie, but it's also a scary sort-of movie. The perfect choice for both Halloween and Christmas, just like the movie, The Nightmare Before Christmas. Tannhäuser is a board game set in an alternate history in the 1940s where a world war has been raging for decades. One faction is obsessed with the Occult and has demons and other supernatural being fighting on their side. If you've never played it, think about the movie, Hellboy, with Ron Perlman. Same idea. What do you think of Grikk the Gremlin? Also, what do you think of my recommendations? Tell us in the comments. Today, we will be introducing a witch who didn't even know that he possessed the powers of witchcraft until much later in life. Before joining the coven and making potions with other witches, he worked in several other professions that were very similar. He was a scientist, a pharmacist, and a university professor of chemistry. Back in those days, his students called him Professor Pullman, but you can call him Albert the Alchemist! 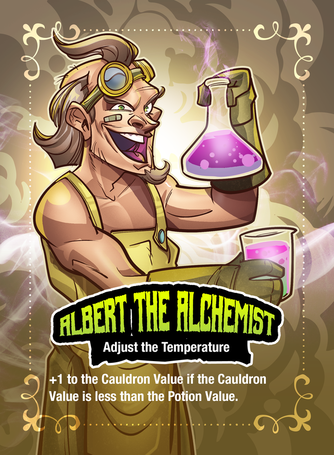 Albert's first Character Ability, Adjust the Temperature, represents his chemistry background and understanding that you can alter potions without having to introduce different ingredients. This Character Ability means that Albert can automatically add +1 to the Cauldron Value during his turn if the Cauldron Value is less than the Potion Value. For example, if the Potion Value is +16 and the combined Ingredient cards in the cauldron only equal +13, Albert will automatically change the Cauldron Value to +14. 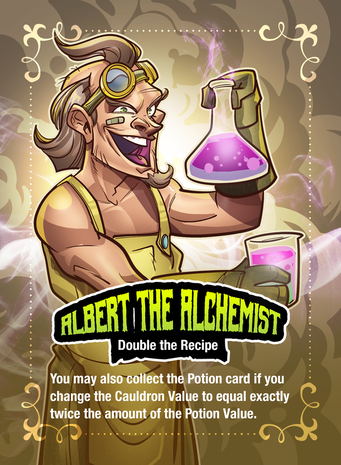 Albert's second Character Ability, Double the Recipe, represents his skill at brewing potions in larger quantities. This Character Ability means that if there is a Potion card with a value of +8, Albert can make the potion if the Cauldron Value also equals +8 just like everyone else, but he can also make the potion if the Cauldron Value is +16 because 8 multiplied by 2 equals 16 (8 x 2 = 16). I chose Harry Potter and the Philosopher's Stone for three reasons: First, it's the first movie in the series. Second, because it has witches. Third, because it has professors who are also witches, just like Albert the Alchemist. I chose Harry Potter: Hogwarts Battle for the same reasons. What do you think of Albert the Alchemist? Also, what do you think of my recommendations? Tell us in the comments. Today we will be introducing the most terrifying witch in the coven. If she were the villain in a movie, it wouldn't be a family-friendly cartoon, it would be one of those movies that gives you nightmares! Her name is Elizabeth the Evil Witch. 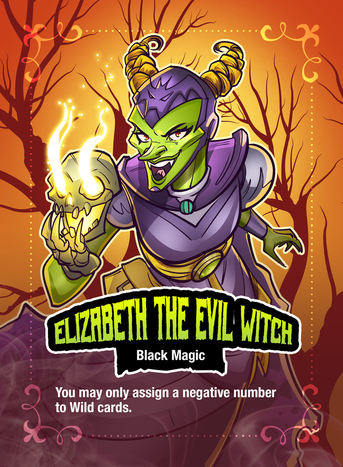 Elizabeth's first Character Ability, Black Magic, represents the fact that Elizabeth is so evil, she is only capable of using the most heinous of magic imaginable. This Character Ability means that Elizabeth can only assign a negative number to Wild cards ranging from -1 to -5. Elizabeth's second Character Ability, Dark Magic, represents her evil influence on magic. 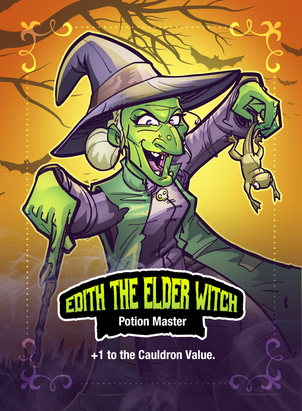 This Character Ability means that Elizabeth can change the value of any 1 Wild card in the cauldron at the end of her turn. The real evil part of this Character Ability is that changing the value of Wild cards affects every witch playing the game. So, for example, if Elizabeth thinks that the witch after her will be able to complete the potion, she can change the value of a Wild card to make it more difficult for the next players. Darkness Falls is movie about a vengeful spirit who stalks its victims in the darkness. She is fast, deadly, and hard to see. This one is worth a watch. Eldritch Horror is another tabletop game based on the Cthulhu Mythos about a world threatened by evil. What do you think of Elizabeth the Evil Witch? Also, what do you think of my recommendations? Tell us in the comments. Witchful Thinking is now 90% funded and we are so close to making this game a reality! When we meet our goal of $6000, Witchful Thinking and the Kickstarter Exclusive Character card, Grikk the Gremlin, will be yours. That's a great start, but we want to make this game better just for you. Witchful Thinking now has Kickstarter Exclusive Stretch Goals! These goals will not be sold at retail and will be rewarded to Kickstarter backers who are receiving a copy of Witchful Thinking! This reward option is a great choice for backers who want an extra copy of the game but don't want to pay double the shipping costs! That's right, you can be a character in your own copy of Witchful Thinking! Your personalized card will be exclusive to you and will not be included in other copies of Witchful Thinking. Stay tuned for another Kickstarter update where we introduce a new witch later today! The potion brewing business at the witch house has been extremely busy lately and the coven is having a hard time keeping up with demand. As a result, the witches decided to hire a young man who hopes to gain valuable witchcraft experience so that he too can be a great witch someday. His name is Ian the Intern! Ian's first Character Ability, Honest Mistake, represents Ian's inexperience and foolish mistakes that he repeatedly makes. 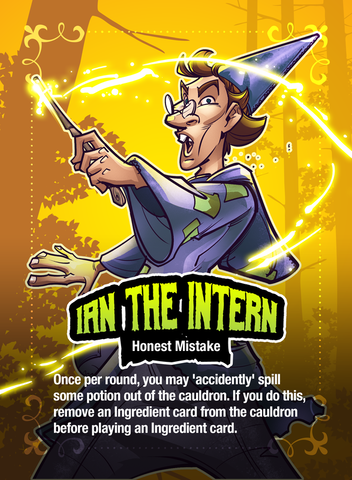 This Character Ability allows Ian to 'accidentally' spill some of the potion out of the cauldron once per Potion card, which means that Ian can remove an Ingredient card from the cauldron, which will reveal the previous Ingredient card under it, before he takes his turn. This Character Ability can be quite useful when making potions. Don't worry about it, Ian, everybody makes mistakes. 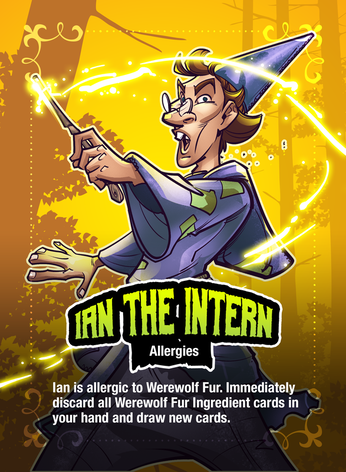 Ian's second Character Ability, Allergies, represents Ian's sensitivity to a certain type of ingredient. 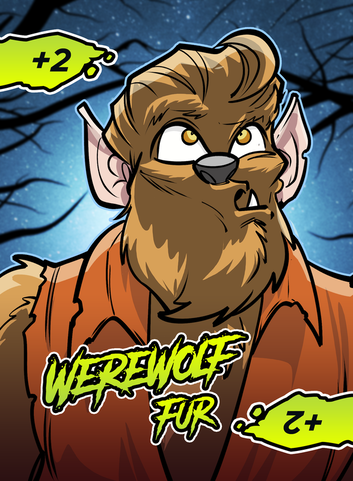 This Character Ability means that Ian cannot use Werewolf Fur Ingredient cards when making potions. He must discard any Werewolf Fur Ingredient cards in his hand and draw new cards, but he can use Werewolf Fur Ingredient cards that other witches have already placed in the cauldron. The Witch is a film about a secluded family in 1630s New England who are being victimized by witchcraft. This movie is interesting and creepy at the same time. The Werewolves of Miller's Hollow is a social tabletop game about the townspeople in a small village who are being terrorized by werewolves. Players take on the roles of werewolves and townspeople, and the object of the game is to find out who is a werewolf and who is not. What do you think of Ian the Intern? Also, what do you think of my recommendations? Tell us in the comments. Today we will be introducing a witch who prefers to not brew potions in the witch house... at least not without using her Land Lotion Potion. 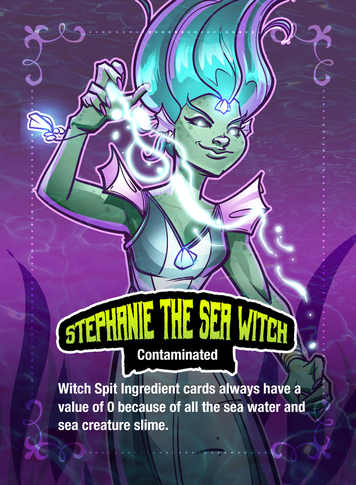 This witch prefers to brew her potions in the ocean because she is Stephanie the Sea Witch! Stephanie's first Character Ability, Contaminated, represents the difficulties of being a sea creature brewing potions in the ocean. Sea water and sea creature slime neutralize witch spit, forcing Witch Spit Ingredient cards to have a value of 0. 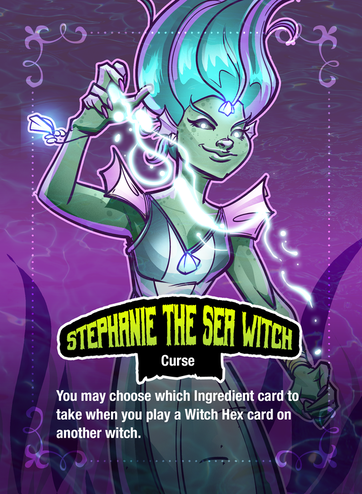 Stephanie's second Character Ability, Curse, represents the sea witch's preference to curse others rather than hexing others. This Character Ability allows Stephanie to choose which Ingredient card she will take from another witch when she plays a Witch Hex card, instead of just stealing a random Ingredient card. The Haunting is your typical ghost story movie of people trapped in a haunted house. Mysterium is a tabletop game about a ghost who is trying to communicate with psychics. The gameplay mechanics in this game are quite unique and clever. That reason alone is all you need to play the game! What do you think of Stephanie the Sea Witch? Also, what do you think of my recommendations and about the tutorial videos? Tell us in the comments. Witchful Thinking only needs another 9% to meet its funding goal and we still have 9 days left! For those of you who missed yesterday's update, video tutorials showing how to play Witchful Thinking are now uploaded on the Kickstarter page. Today we will be introducing a very talented witch who is unmatched in magical ability... at least that's what he thinks. He is actually a very powerful witch, but his advanced abilities have made him a little bit arrogant. His name is Simon the Sorcerer! 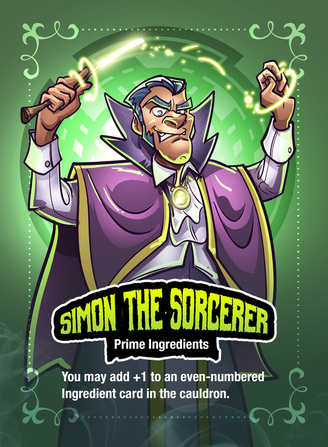 Simon's first Character Ability, Prime Ingredients, represents the fact that Simon is so particular, he only uses the best ingredients when brewing potions. This Character Ability allows Simon to add +1 to an even-numbered Ingredient card in the cauldron during his turn. Simon's second Character Ability, Consult the Spell Book, represents Simon checking the coven's spell book to see how he can improve potions, just like any smart witch should. 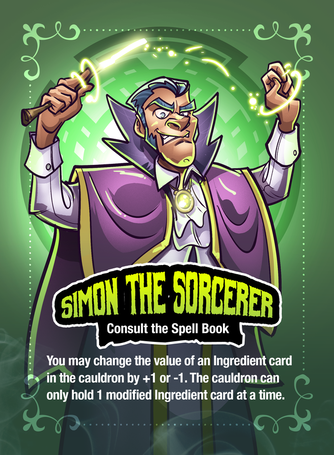 This Character Ability allows Simon to change the value of an Ingredient card in the cauldron by +1 or -1. For example, if an Ingredient card in the cauldron has a value of +3, Simon can change it to +2 or +4. The cauldron can only hold 1 modified Ingredient card at a time. House On Haunted Hill is a film about a group of people who are invited to spend the night in a haunted house. Those who survive until morning will win $1,000,000. A tempting offer, don't you think? Ghost Fightin' Treasure Hunters is a tabletop game about treasure hunters in search of valuable jewels in a haunted house. This tabletop game is a must play! What do you think of Simon the Sorcerer, and what do you think of my recommendations? Also, would you agree to spend a night in a haunted house in exchange for $1,000,000? Tell us in the comments. Today we will be introducing a very wise old hermit with magical powers... and no, I'm not talking about Obi-Wan Kenobi. His name is Wallace the Wizard! 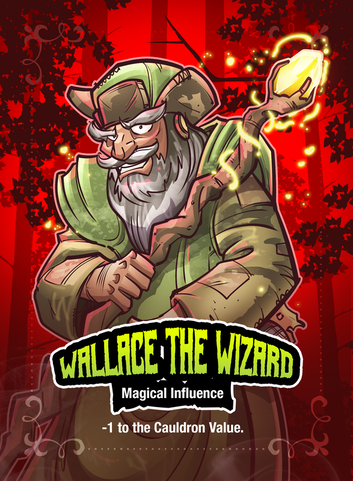 Wallace's first Character Ability, Magical Influence, represents Wallace bending potions to his will through magic. This Character Ability allows Wallace to subtract 1 to the Cauldron Value. For example, if the Cauldron Value equals +10, it will actually equal +9 for Wallace. 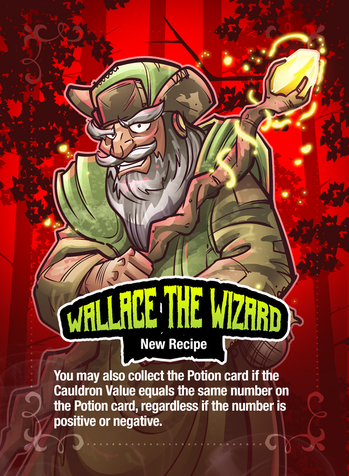 Wallace's second Character Ability, New Recipe, represents Wallace finding new ways to make the same potion. This Ability allows Wallace to make potions when the Cauldron Value is the same as the Potion Value, but he can ignore the addition and subtraction symbol. For example, if Wallace is trying to make a potion that has a value of +8, he would make the potion if the Cauldron Value equals either +8 or -8. The Addams Family is a great film about a very strange family who treat everyday like Halloween. A true Halloween classic... if 90s movies are considered classics that is. Mansions of Madness is another tabletop game based on the Cthulhu Mythos about monsters and insanity. This is great game, but to be fair, I would probably like any game that is based on the Cthulhu Mythos. What do you think of Wallace the Wizard? Also, what do you think of my recommendations? Tell us in the comments. Today we will be introducing a very powerful wielder of magic who has a knack for transfiguration spells. Her name is Sophie the Sorceress! Sophie's first Character Ability, Powerful Magic, represents how gifted she is at using magic spells. Her magical ability even surpasses Simon the Sorcerer and Warren the Warlock! 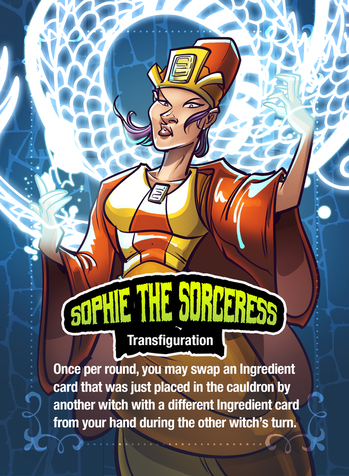 This Character Ability allows Sophie to assign +1 to the assigned value of all Wild cards in the cauldron. This Character Ability means that if a Wild card with a value of +4 is in the cauldron, the value automatically changes to +5 for Sophie. Sophie's second Character Ability, Transfiguration, represents Sophie's magical specialization of turning things into something else. This Character Ability allows Sophie to swap an Ingredient card that was just placed in the cauldron by another witch with a different Ingredient card from Sophie's hand during the other witch's turn. Sophie can use this ability once per Potion card. For example, if Edith the Elder Witch placed a Vampire Fang Ingredient card into the cauldron, Sophie could take that card and replace it with another card instead. Tabletop Game: Who Goes There? The Thing is a prequel to John Carpenter's The Thing. This movie explains what happened at the Norwegian Outpost before Kurt Russell and his team encounter The Thing. The prequel might not compare to John Carpenter's original, but it is a great film nonetheless. Who Goes There? is a tabletop game named after the novella that inspired John Carpenter's The Thing. I received my Kickstarter copy of the game not too long ago, but I haven't played it yet. A cooperative tabletop game based on The Thing? What's not to like? 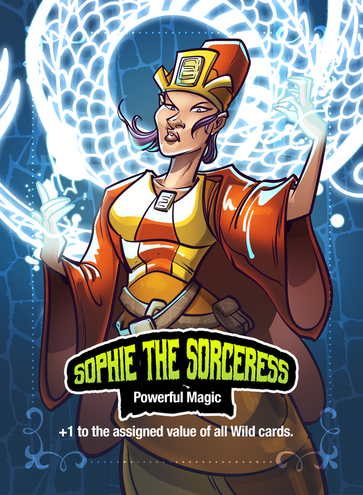 What do you think of Sophie the Sorceress? Also, what do you think of my recommendations? Tell us in the comments. Despite hiring Ian the Intern, the coven is still having a hard time keeping up with customer demand at the witch house. As a result, the coven summoned a being from beyond who is by far the most powerful witch in existence. Her name is Diana the Demon Witch! Diana's first Character Ability, Possess, represents the demon possessing other witches in the coven and controlling their actions. This Character Ability allows Diana to draw 3 Character cards that are not in play at the start of the game. When a new Potion card is drawn, Diana can choose 1 Character Ability to use while brewing the potion. Since each Character card offers 2 different Character Abilities, Diana has 6 to choose from! 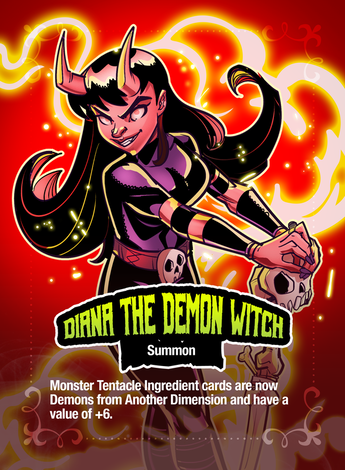 Diana's second Character Ability, Summon, represents the demon calling other demons from another dimension to help her brew potions. This Character Ability allows Diana to change the value of Monster Tentacle Ingredient cards from +5 to +6. The Exorcist is a great film about a young girl who is possessed by a demon. This film is a classic! Chaos in the Old World is a tabletop game where each player controls a god bent on corrupting, destroying or enslaving the world by using their malicious powers and summoning demons and cultists. Sounds like a tabletop game worthy to be played during the month of Halloween to me! I highly recommend this game. 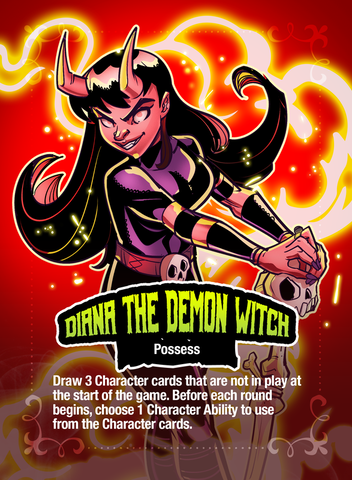 What do you think of Diana the Demon Witch? Also, what do you think of my recommendations? Tell us in the comments. Witchful Thinking is so close to being 100% funded. We need less than $500 and we still have 5 days to go! 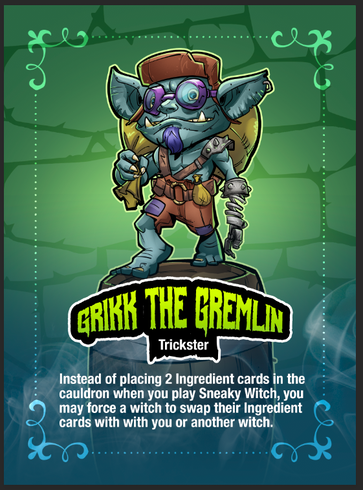 Every Character card has now been introduced, including the Kickstarter Exclusive, Grikk the Gremlin. Keep in mind that the Coven always has room for more witches because if Witchful Thinking reaches its Stretch Goals, more Kickstarter Exclusive Character cards will be unlocked! Also, backers can choose a reward option for Witchful Thinking to get their very own custom Character card included with their game. Bram Stoker's Dracula puts a unique spin on this classic tale by turning a monster movie into a love story... filled with death. This film also features an all-star cast which includes Gary Oldman, Anthony Hopkins, Keanu Reeves, Winona Ryder and Cary Elwes! Dungeons & Dragons: Castle Ravenloft Board Game is based on the timeless RPG about a group of warriors slaying evil inside a vampire lord's castle dungeon. Out of all of the characters, who is your favourite Coven Member and why? Also, what do you think of my recommendations? Tell us in the comments. Witchful Thinking only needs under $400 to be 100% funded and we still have 4 days to go! Thank you all for believing in this project. It is the weekend before Halloween, and since Halloween falls on a weekday this year, many of you will probably be having a Halloween party tonight. If that is the case, watching only 1 movie or playing 1 tabletop game is not nearly enough. Therefore, I recommend a movie and tabletop game marathon. Tabletop Games: Fury of Dracula, Arkham Horror, Cthulhu Gloom, Ghost Stories, and Zombies!!! What do you think of my recommendations? Also, what are your plans for a Halloween party? Tell us in the comments. We are getting closer everyday to making Witchful Thinking a reality. We only need less than $250! You are all amazing! For our new backers, I encourage you to check out our previous updates to learn more about the various Character cards and the exciting Character Abilities that come with them. Army of Darkness is a great film about a chainsaw-wielding hero who involuntarily goes back through time to the dark ages to battle Deadites with his trusty boomstick. Zombicide: Black Plague pairs perfectly with Army of Darkness because it is essentially the movie in tabletop-game-form. What do you think of my recommendations? Also, who/what are you dressing up as for Halloween? Tell us in the comments. Witchful Thinking is now fully funded and all backers will automatically receive the Kickstarter Exclusive Character card, Grikk the Gremlin, which will not be sold at retail! Thank you all so much for believing in this project and helping it become a reality. We still have 3 days to go, let's see if we can unlock more Kickstarter Exclusive items for Witchful Thinking! Some kids dreamed of being an astronaut, a police officer, or a firefighter growing up. Not me. My dream job was being an exterminator... of the paranormal. Ghostbusters is a great movie with an amazing cast. This is one of my favourite movies of all time! Ghostbusters: The Board Game is the obvious choice to pair with the movie. For those of you who don't know, Ghostbusters: The Board Game was also on Kickstarter and offered several Kickstarter Exclusive items to backers which made the Kickstarter version of the game so much better than the retail version. With or without Kickstarter Exclusive items, Witchful Thinking is a great game, but let's make this game even better just for you! What do you think of my recommendations? Also, what Kickstarter Exclusive items would you like to see? Tell us in the comments. We have hit our second Stretch Goal and you will all receive another Kickstarter Exclusive Character card with your copy of Witchful Thinking! We will introduce this character in another update. All I can say for now is that you'll like it. I can't take any credit for this one though. This Character card will be illustrated by our artist, Jackson Gee, and the character design and Character Abilities were created by my wife. We still have 2 more days to reach more Stretch Goals which are really awesome! Spread the word so we can give you backers some cool stuff. Our family has a tradition of watching Hocus Pocus on the day before Halloween, or All Hallows Eve Eve, because we just can't begin Halloween without seeing this movie. This is a great movie about a few witches from 1693 who receive a culture shock when they find themselves suddenly living in 1993. Potion Explosion is a tabletop game about students taking their final exam in Potions class. I have not played this game yet, but it looks fun. Also, I wanted to share with you all that I finally saw the new Halloween movie in theaters last night. I have been trying to see this movie since it came out, but I never had the chance. For those of you who don't know, I am a huge fan of the Halloween movies and I have been ever since I was too young to watch them. For me, the Halloween series is, by far, my most favourite series of all the scary movies out there. One thing that is interesting about the Halloween franchise is that a lot of the sequels ignore previous films in the series. This new film ignores every sequel in the series and acts as the new sequel to the original from 1978. In the original Halloween, Michael Myers was evil in human form and appeared to kill at random. The sequels in this series chose to give Michael a motive of him wanting to kill members of his family and he only killed other people that simply got in his way. This new sequel dropped that backstory and now Michael just kills at random. Personally, I thought giving Michael the motive of wanting to kill members of his family was genius. I have to admit though, Michael in this new film is scarier now because the audience doesn't know why he does what he does. For you fans of the Halloween franchise, what did you think of the new film if you've seen it? Also, do you prefer Michael to have a motive or do you prefer that Michael kills at random? What do you think about my recommendations? Also, what movie are you dying to watch on Halloween? Tell us in the comments. Yes, Halloween is finally here and the Kickstarter campaign for Witchful Thinking ends at 11:59 pm Mountain Time tonight! I will be sending out another update later in the day to let you know how Witchful Thinking is progressing and to offer my recommendations on how to celebrate the month of Halloween, but I wanted to offer a special Halloween reward to backers. We have reduced the price of the Custom Character Card Reward Option! We are less than $250 away from another Stretch Goal and we still have 6 more hours before Witchful Thinking's Kickstarter campaign is over! Let's see if we can unlock the next Kickstarter Exclusive card! Now that it is Halloween, is everyone ready for the big night? How did you decorate your house? What type of Halloween treats did you buy/bake? What games will you be playing tonight? What movies will you be watching tonight? I hope everyone is having a great Halloween! We are down to our last 3 hours and we only need less than $250 to unlock our next Stretch Goal. Witchful Thinking has reached $7000, which means that another Kickstarter Exclusive Character card has been unlocked! We still have over an hour to go, maybe we can unlock another Stretch Goal before the night is out. Thanks to you all, Witchful Thinking was a success! Thank you all so very much for making this project become a reality! All backers who are receiving a copy of Witchful Thinking as a reward will also be getting three Kickstarter Exclusive cards as well. One of these cards, Grikk the Gremlin, has already been introduced; the other two will be introduced later on. Now that the Kickstarter campaign for Witchful Thinking has ended, I won't be sending you updates everyday. Instead, I will send updates when I have new information to share, such as shipping information, pictures of the prototype for Witchful Thinking, and of course I will be introducing the Kickstarter Exclusive Character cards. If I haven't sent an update in a while, I might send one out simply to inform you all that I have nothing to report just so you know that I haven't forgot about you. Halloween 5: The Revenge of Michael Myers is a chilling chapter in the Halloween franchise. I actually have this film paused at the moment, and I will be watching the rest of it after I send this update. A Study in Emerald is another tabletop game based on the Cthulhu Mythos set in a time when the world is ruled by the Old Ones and a group of revolutionaries are trying to overthrow them and their cult followers. I highly recommend this game. How was your Halloween? Also, what do you think of my recommendations? Tell us in the comments. Once again, thank you all so much for backing and for believing in this project! The last time that I posted an update, Halloween had just ended... and now the Christmas season is upon us. We have been closely examining the game contents and revising a few things just to ensure that the game is as user-friendly as possible. We have also sent our digital files to the manufacturer and are now eagerly waiting for the prototype. If the prototype looks good, we'll move forward with mass-production. You may remember that, with your help, we were able to unlock 3 Kickstarter Exclusive Character cards. 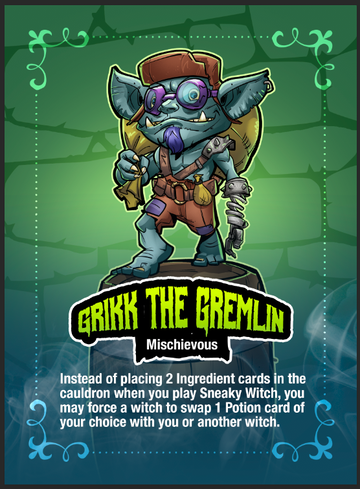 One of the cards, Grikk the Gremlin, was revealed during the Kickstarter Campaign. Since the Kickstarter campaign ended, our artist has been busy creating the other 2 Character cards. For some time now, the coven of witches have been feeling uneasy whenever they brew potions in the witch house. Every now and then, they feel as if someone, or something, is watching them. They have also started hearing an unfamiliar voice speaking out of nowhere. Finally, one day, the witches discovered something floating near the cauldron and brewing potions. It was a ghost, and her name is Patricia the Poltergeist! Patricia's first Character Ability, Ghost, represents all of the ectoplasm (or Ghost Goop) that she leaves around. When Patricia places Ghost Goop into the cauldron, it is super concentrated with ectoplasm and is worth +4 instead of +3. Patricia's second Character Ability, Haunt, represents how spooky ghosts can be. Haunt allows Patricia to scare another witch into missing their next turn. Patricia can use this ability once per Potion card. What do you think of Patricia the Poltergeist? Tell us in the comments. The coven has a furry companion for a pet, Cuddles the Cat, but is one pet really enough? Veronica the Vampire Witch certainly didn't think so. She brought her own pet to join the coven, and her name is Betsy the Bat! I wonder if Betsy the Bat and Cuddles the Cat will get along. Betsy's first Character Ability, Echolocation, represents Betsy's unique senses to find the best ingredients. This Character Ability allows Betsy to double the value of an Ingredient card that she places into the cauldron. So, if an ingredient has a value of +4, Betsy can keep the value as is, or can change it to +8. Betsy's second Character Ability, "It's in my hair! ", represents how people may react to bats if they are scared of them... and if the bat flies around them and maybe land on their hair. This Character Ability allows Betsy to interrupt another witch's turn by making the witch take back an Ingredient card that he or she just placed into the cauldron and exchanging it for a different Ingredient card. What do you think of Betsy the Bat? Tell us in the comments. I hope everyone had a great holiday. I know I did. Just before Christmas, I received a present in the mail. That's right, the manufacturer sent me the prototype for Witchful Thinking in wrapping paper! I thought that was awesome. Long story short, the game looks great. After some careful review, and a few minor changes, the prototype has been approved!